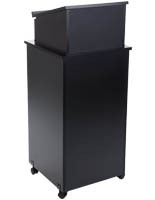 This pulpit is convenient as a mobile lectern or portable podium. 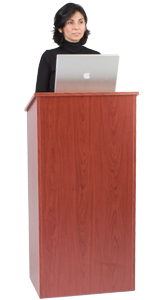 This podium, a knock down pedestal is portable due to how easy it can be taken apart and reassembled. 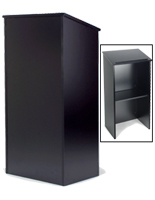 The pulpit, hostess stand, orator podium, preacher lectern or communion table comes with an included Phillips screwdriver to ensure users have all the tools needed to put this portable stand together. 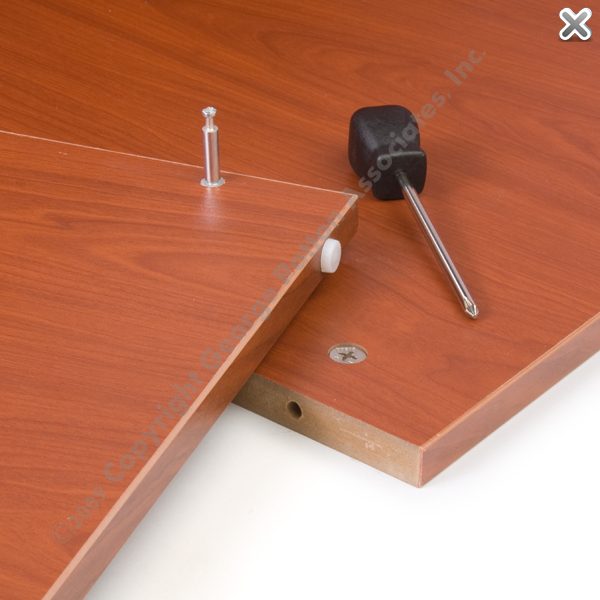 This podium ships with all necessary hardware to assemble properly. This pulpit, such as communion table can be assembled in a few minutes by a single person. 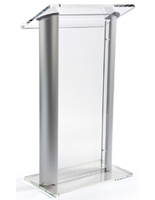 The screw holes on this podium feature nylon thread inserts to allow the screws to grip better when installed. 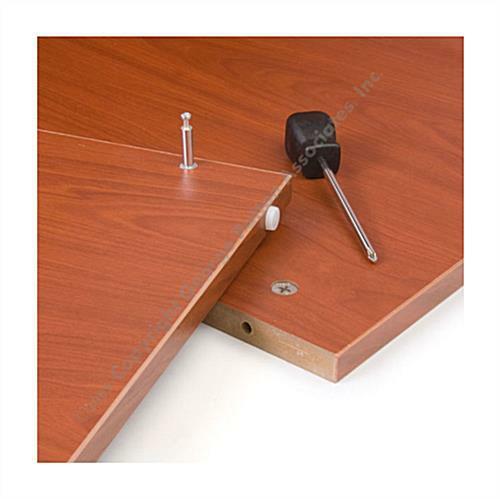 Some competitor's pulpit stands that require customer assembly, don't have these thread inserts and it is possible for the screws not to thread correctly and in turn the furniture is not totally stable when assembled. This podium also has a wrist rest for ergonomics while speaking. 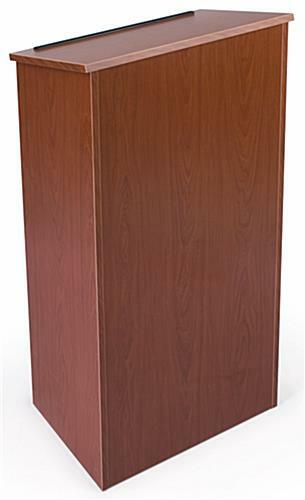 This pulpit, church lectern or portable podium is made of 3/4" thick laminated MDF, for a strong, sturdy, stain and scratch resistant pedestal. 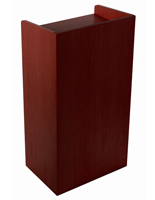 This unit is also offered in several other wood finishes to match or complement other fixtures within your church or business. 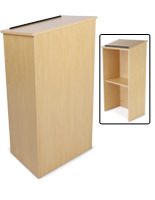 This pulpit, church lectern, hostess stand or portable podium also has a middle shelf to hold a glass of water or media equipment that may be required while lecturing. 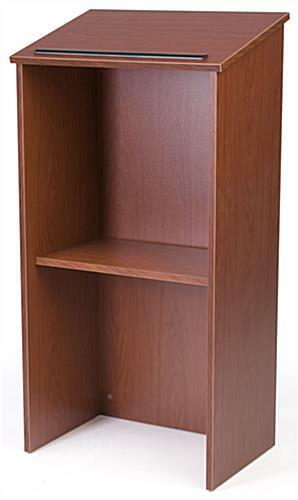 Restaurants use this piece of furniture as a hostess stand. 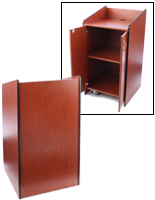 This pulpit, such as portable lectern, or restaurant podium ships by ground in 1 box to minimize shipping costs. 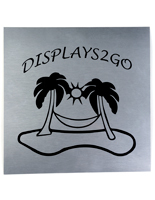 Most businesses purchase this stand as a cost-effective alternative to the pricey solid wood units. 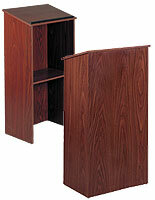 Buy this pulpit for your church, restaurant or meeting room today! 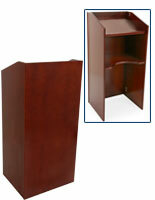 Constructed of laminated MDF for a sturdy, strong, and water resistant pulpit.